Gluten Free? Low Carb? Whatever! 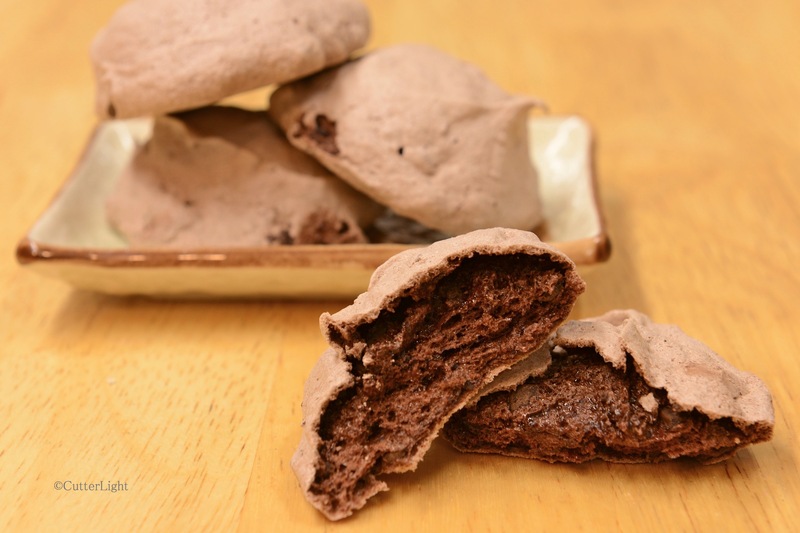 Just Eat These Fudgy Chocolate Meringues! Fudgy meringues with a crispy, melt in your mouth shell will have you attending “Meringues Anonymous” if you’re not careful! These meringues are quick and easy to make but do require an overnight stay in the oven to finish drying in order to create that crispy exterior. Preheat oven to 350 degrees F. Line two baking sheets with parchment paper. Set aside. Place egg whites and sugar in the bowl of a stand mixer. Place bowl on top of pot of simmering water, for a double boiler effect. Whisk eggs and sugar for a couple of minutes until sugar is just dissolved. Place bowl back on stand mixer. Mix on high speed until eggs are thick and glossy and hold soft peaks. Sift cocoa onto egg mixture. Mix on high speed until cocoa is just incorporated. Fold smashed chocolate chips into egg whites. Use a cookie scoop to drop batter onto parchment-lined baking sheets. Bake cookies for 10 minutes. Cookies should puff up and may crack. Remove cookies and leave oven door open to cool down. Place cookies back in oven, close oven door and let cookies sit overnight. The next day, cookies will be cooled completely and can be easily removed from parchment paper. Store in airtight container. ← Deep Fried Parsnips – World’s Best Bar Snack? We’ve studied drinking beer excessively and our experiments with the substance have shown that weight gain is possible over a long period of time. Excessive use of beer can lead to peeing in strange places. Thanks!!!! Great looking recipe, too! We discovered something similar to these before Christmas which were just divine so look forward to making yours also! My MIL eats gluten free…these look yummy…passing on the recipe to her! As always, Thanks for the recipe! Those look absolutely Yummy!! !